We provide Self Propelled Barges on Voyage Charter and Time Charter for carrying general cargo in coastal waters. The Self Propelled barges are possessing permission and are capable of inland navigation as well as for Port to Port navigation. The Fleet of self propelled Barges from loading and unloading of ships at anchorage is also available which can load cargo from the Jetties as well as from outer anchorage. Small dry cargo ships mainly known as mini bulk carrier are ships of carrying capacity 1800 DWT to 10,000 DWT. These ships are capable of carrying small dry bulk cargo parcels and are extremely significant for regions generating small cargoes regularly. We are brokers and presently we also are providing mini bulk carrier services within Indian waters as well as neighboring countries on voyage charter for regular cargoes and also on time charter. The mini bulk carriers available are of 1800 DWT, 2000 DWT, 2500 DWT and 2800 DWT for time charter and also for on voyage charter for regular cargo. These mbc’s are capable of operating in river channels and coastal waters under management of skilled crew. For more details on available mini bulk carriers, kindly contact us with your cargo details, laycan and charterers complete particulars. the MBC with Indian Flagare TypeIV and IRS class vessels and easily operated in open sea (ocean ) with speed of 6-8 knots. 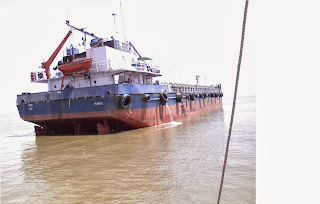 Self Propelled ocean going cargo barge available with all valid sailing permissions in Indian Waters. The carrying capacity of these MBCs are ranging from 1800 DWT, 2000 DWT, 2200 DWT, 2500 DWT. The loaded draft of the MBC is ranging from 3.2 mtrs to 4.6mtrs. Some of the MBCs are capable of operating at shallow ports or minor tidal ports also. The MBC we provide on time charter and voyage charter are possessing all valid permissions to trade in lawful dry bulk cargo with in Indian Waters. For all your requirements of Mini Bulk Carriers and Self propelled Ocean Going Cargo Barges, contact us with particulars of cargo along with required time period and operating ports. The mini bulk carriers can be made available in short notice of 2 days to max 7 days depending upon availability and operating region and cargo. We arrange mini bulk carriers and self propelled barges directly from owners and are interested to enter into contract for not less than six months. Mini Bulk Carriers are without gears and for loading and discharge, shore cranes are required and to be arranged by charter party. Interested charterers or chartering companies, do contact us for charter hire rates at any time on the provided contact details. For Coastal transportation of break bulk cargo. The MBC is available for trading in west coast of India as well as at east coast of India. The MBC is gearless and with hydraulic hatch covers direct from owners. The owners interested in long time charter within Indian Waters. The MBC available are of Built year between 1998 to 2008. For transporting any lawful harmless dry break bulk cargo, charter’s directly can contact us with requirement details and operating region for trading of vessel. MBC is available at present and subjected to fixture. Kindly get in touch with us for availability of the MBC matching your laycan. The MBC is RSV Type 4 and also can be operated at shallow waters with respect to the quantity loaded. The standard speed of MBC available is 8 to 10 knots. All MBCs are Indian Flag are IRS class. Inspection of the barges are provided against release of work order. Self Propelled Cargo Barges of IV Class are utilized for ships to ship lighterage operations. basis on trip basis / per day dry rental and also on monthly rental for lighterage job work. The barges are available round the clock with experience crew and latest onboard equipments. for all dry bulk commodities. For lighterage operations, self propelled barges are chartered. Our Services includes handling and providing self propelled barges, dumb barges / flat top barges with Tugs, documentation, etc. for short charter periods. 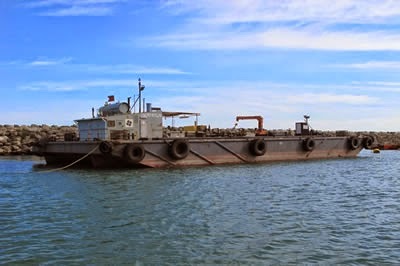 Available Flat Top Barge / Dumb Barge with tug, self propelled cargo barges, mini bulk carriers.Inspection of barges are allowed before delivery to charter party. Delivery- Re-delivery charges extra and in charterers account. Barging and lighterage services are available for all types of bulk dry commodities. Complete long terms contract are also undertaken. The mini bulk carrier available for trading any lawful dry bulk cargo for operation with in Indian Water Limits. WINDLASS : 1 No. -2 Speed / 5500 kg Pull @ 4.5 / 9.0 M /Min. 2 Warping Heads / 350mm dia.